When you think of a new year, you think of all the things you want to do or have to do to make the year a successful one. Often times, you hear people say, “this year is going to be my best year.” I say every year will be my best year no matter what trials, set backs, or obstacles I face. Life comes with setbacks and bumps along the road; however, you can still get to the finish line and have a fulfilling year if you keep going, value the lessons learned, change your perspective on some things, live on purpose, and most importantly, let God take the wheel of your life through salvation as well as consecration and preparation. As I most likely have mentioned before, I have always been goal-oriented. I would write a list of goals down on paper often and read over them on a regular, sometimes daily, sometimes weekly, checking off goals as I accomplished them or noted them if I hadn’t. Have you been thinking about your purpose or mission in life? Have you pulled back out that list of goals that was safely tucked away in your drawer? Have you created a bucket list or vision board yet or made your resolutions for 2016? Will this year be the year you gain ground and not lose it? Will this be the year you let go and let God? A vision board is a visual tool that exemplifies and clarifies your goals and/or missions. Literally, a vision board is any sort of board on which you display images that represent whatever you want to be, do or have in your life (http://makeavisionboard.com/what-is-a-vision-board/). A bucket list is a number of experiences or achievements that a person hopes to have or accomplish during their lifetime (Google). Both the vision board and bucket list give visuals and motivation to the goals that are ideas that leave imprints on your mind. I firmly believe that the more you write and see your goals, the more you are impressed to act on them and bring them to fruition. So, let your bucket list and vision inspire you to take the steps to make your dreams come alive. I haven’t yet created a bucket list, ever, but I have created a vision board and a new one for 2016 that I will most likely fine tune later. 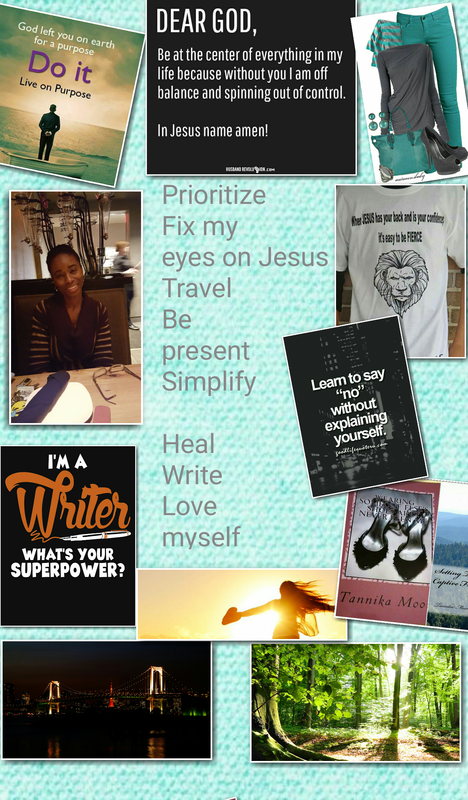 I also wanted to give you a sample vision board and share some of the goals that are my priorities this year. I have to learn to say no, the type of no without explaining myself. I want to walk confidently in my skin, redefine my style as I grow into that confident woman. I have to do the second part of “love your neighbor as yourself”. 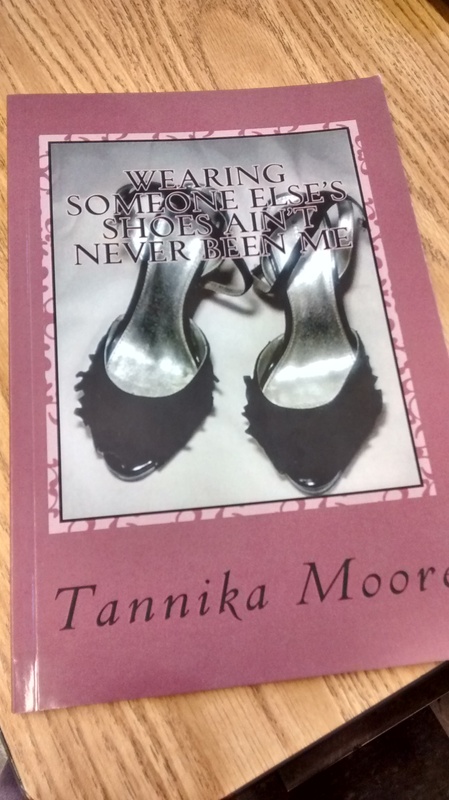 I have to continue building my career as an author, using the writing talents combined with the spiritual gifts-Exhorter, Compassion Person, Giver-God gave me to minister to and spread God’s love to people through the words God inspires. I want to be intentional with my time and be present. I want to travel and live free of the grips of fear. I want to get to the point where Jesus can get my undivided attention and devotion. Those are my vision board goals. If you are looking to create your own visual of your goals and priorities, read the Tools for your Journey below. Prepare mentally, emotionally, spiritually, etc. Get a journal notebook, pens, highlighters. Think about what it is you want, have wanted to do, need to do. Pray that God will help you to prioritize those goals, reveal the motives of each goal, and gather His Word on each goal. Get some friends or family together and have a vision board party. Get white plain boards, magazines, scrapbook materials, markers or laptops and cellphones if you want to do virtual boards. Place your vision boards, goal lists in places you can see them or regularly view them. Remember to take it one day at a time and one step at a time. Seek God and don’t be afraid to ask for help. Set deadlines once God has revealed the season to operate and be consistent towards reaching your goals. Have a grateful and positive attitude. Expect setbacks and opposition. But trust God and press anyway. Revisit your goals, and don’t be so focused on them that you can’t be present and enjoy life and all you have now. Question for you: So, what will be on your vision board, bucket list, goal list? This entry was posted in Goals and tagged bucket list, vision board. Bookmark the permalink.